I don’t allow my children to bring toys to school. They are, however, allowed to bring books. So, everyday I have at least 4 books to read that the children have brought in…but I don’t mind. Usually they bring books they’ve gotten from our Scholastic book orders. Today was different. Today a child brought a book in for me to read that she made! Her dad wrote down the words and she drew all the pictures! It was too cute! All the children loved the idea! Since it was right before lunch, I told them that tomorrow I would staple together some small books and they could ask us to help them write the words while they drew the pictures. I told them I would even read them to the class when they were done. This got them really excited! I hope they’re still this excited tomorrow when I remind them of the activity! I would love for my class have the confidence to see themselves as authors! That would be great! So, we’ll see how it goes tomorrow – I’m excited! 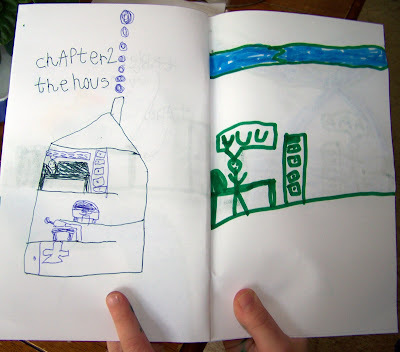 I keep small stapled blank books in our writing center for the kids to make their own books. They love it. Can’t wait to see what you get.